Behind the soon to be completed Moonrise Hotel in the Loop stood this simple modern building. The building was designed by and housed the offices of the architectural firm of Murphy & Mackey. Murphy & Mackey was one of the more innovative firms in St. Louis during the modern era, and brought us such landmarks as the Resurrection of Our Lord Catholic Church, The Climatron (based on Buckminster Fuller's concept), and Washington University's Olin Library (which has been horribly altered). The building on Enright however was very reserved and somewhat utilitarian in nature. The covered driveway led to parking in the rear (a nice urban solution to the parking access issue). 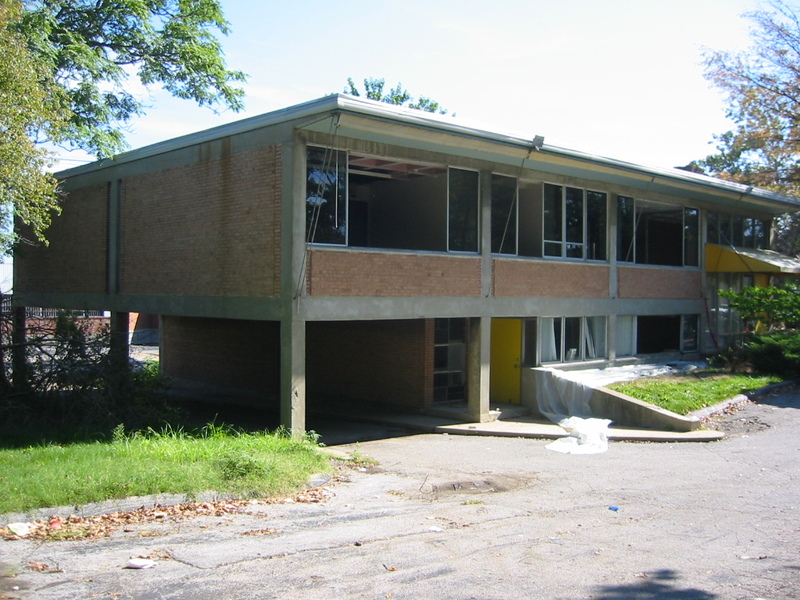 The rear of the building shaded by a continuous canopy faced south to the parking lot. There was an entrance at the first floor off the porte cochere and a more prominent entrance at a mid-level between the floors on the east bay. The main entrance framed by a glazed wall and a small paved area. 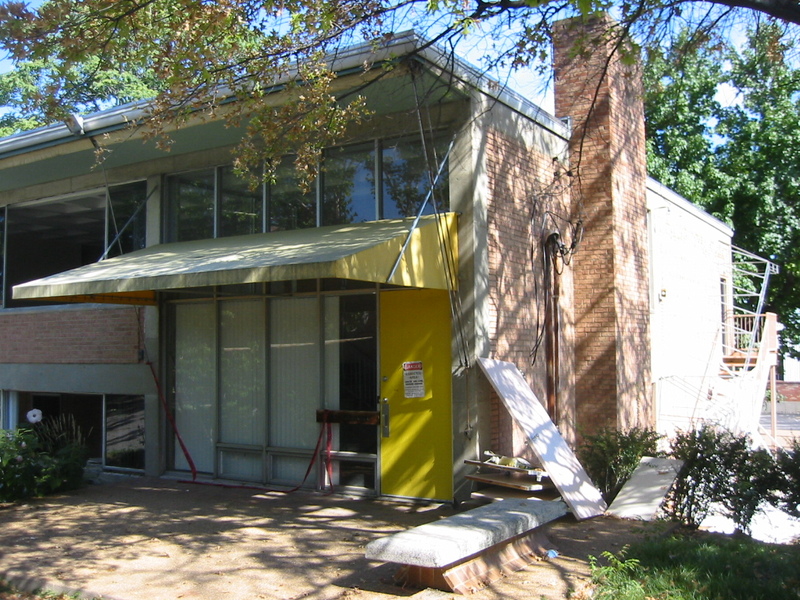 The yellow awning is an obvious addition, in fact the original canvas awning shading system can be seen still intact under the brow of the canopy. The metal staircase at the northeast corner was added in 1995 according to City records. 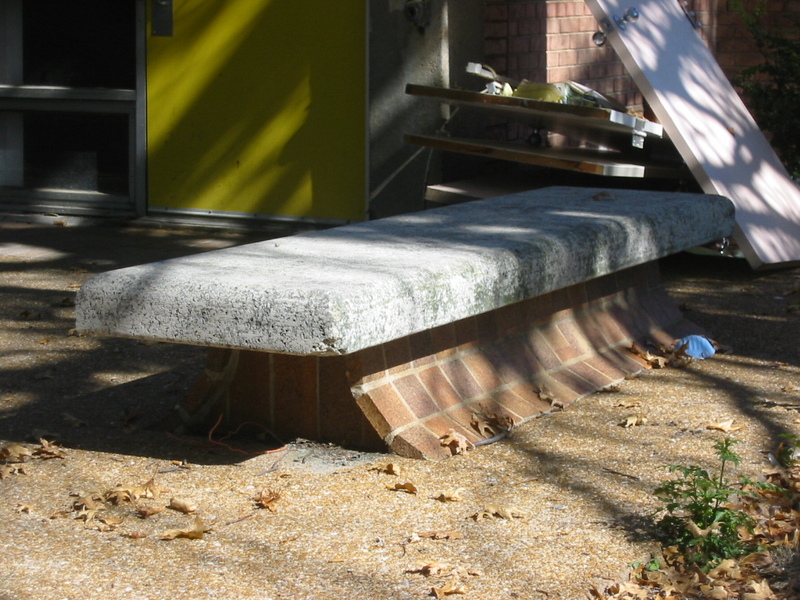 This bench appeared to "grow" out of the paving. The interior of the building was as straight forward as the exterior with exposed waffle slab ceiling and exposed brick at the end walls. 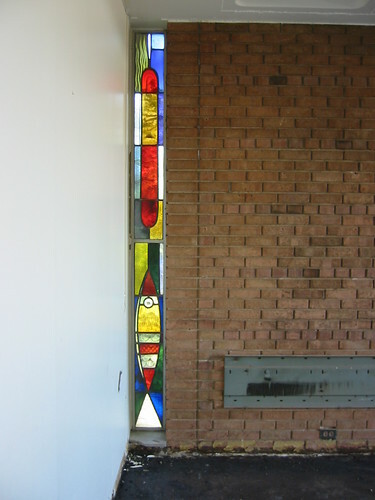 The one element of this simple building that stood out was a pair of narrow stained glass windows in the middle of the west wall. Inside, these windows were the only glazing in two private offices. 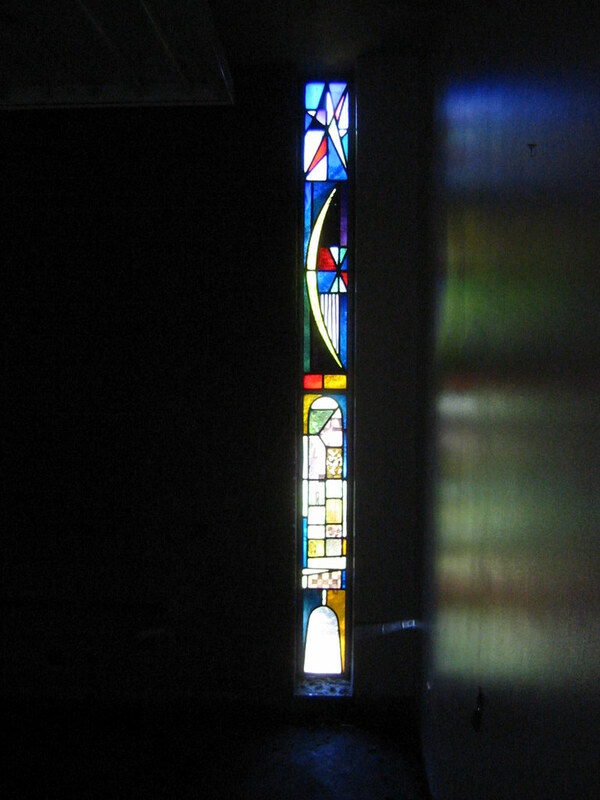 Detail of one of the windows below. Were these windows the work of Emil Frei, who created windows for a number of churches by Murphy & Mackey? I am not sure if these windows were salvaged or lost in the rubble pile. 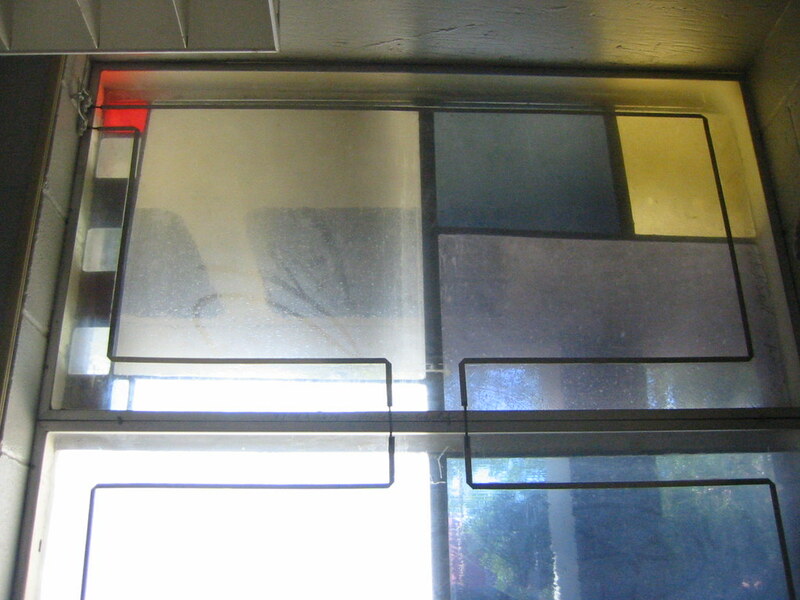 Below is a portion of a much less ornate art glass window which flanked the first floor entrance off the porte cochere. 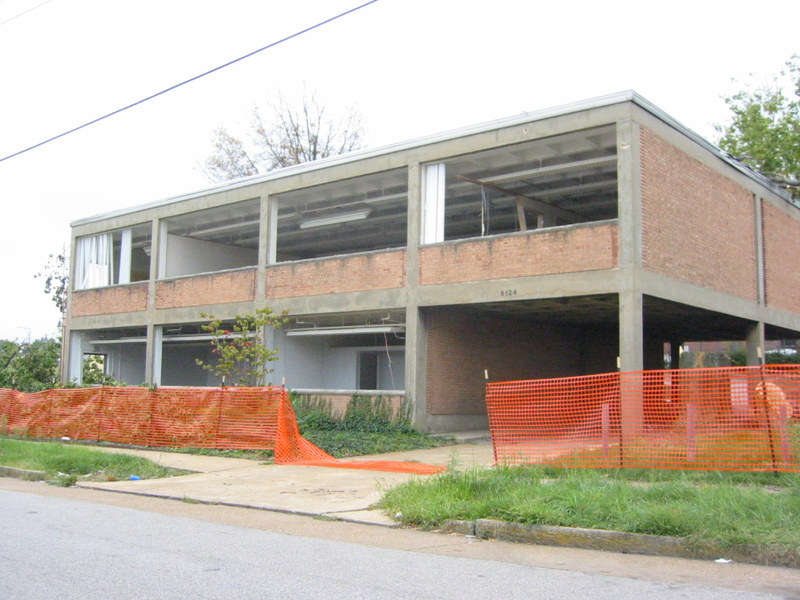 The building was demolished in fall of 2004 to expand the parking lot behind the Pageant. 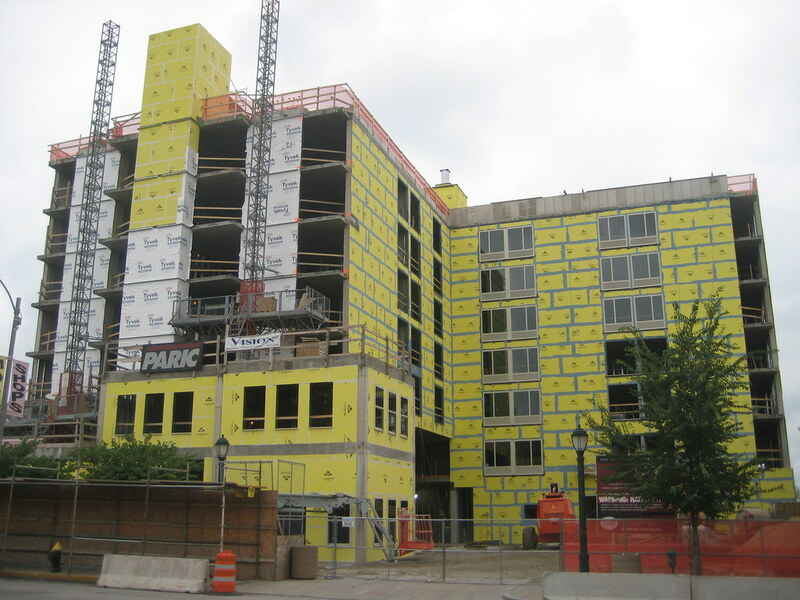 The expanded lot serves many of the newer developments in the Loop in the last several years, including the Pin-up Bowl, the soon to be opened Moonrise Hotel, the Regional Arts Commission, and several other retail/office buildings on the south side of Delmar which do no have much of their own parking. The photo above shows the building prior before demolition, and below shows the enlarged parking area. The sad thing is that the small footprint was replaced occupied an area of only 12-18 parking spaces. In other words, the building could easily have been spared and the new parking laid out around it. 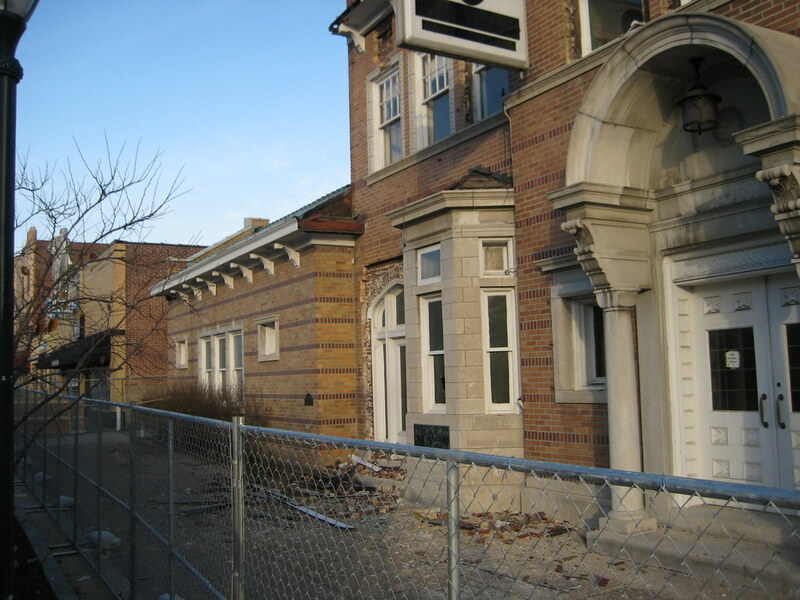 The photos also show Wash U's clearance of several industrial buildings on the north side of Enright. 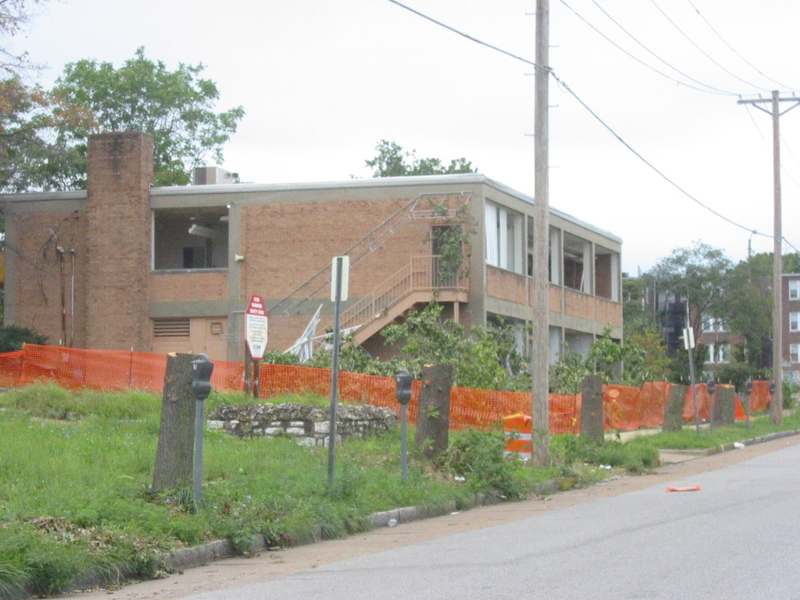 In addition to the building, an entire row of mature trees stretching almost the entire block were mowed down only to be replaced by saplings. 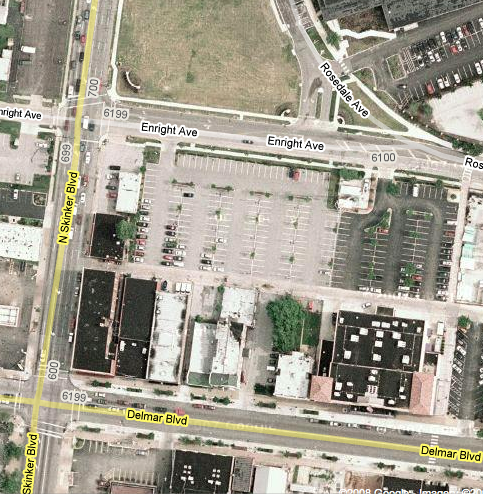 These trees at least would have done a good job of screening the surface parking from the street. 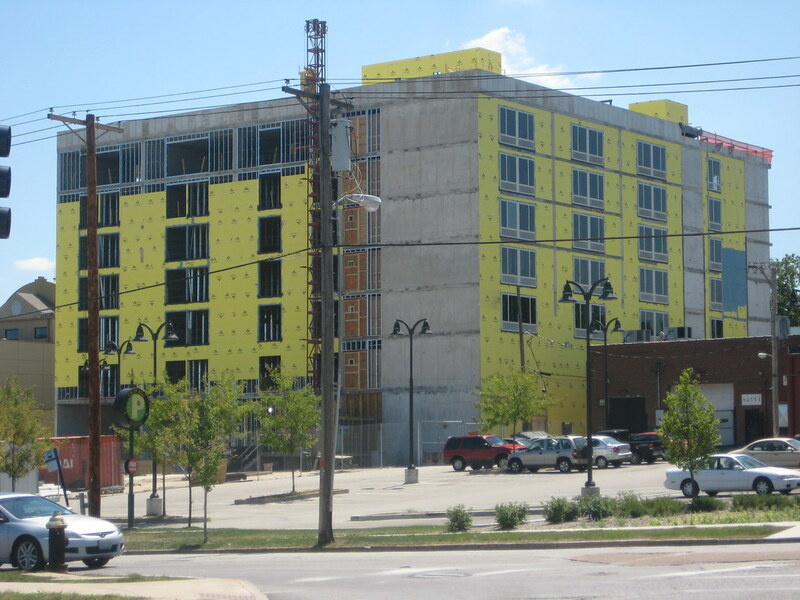 Today this is the view from Skinker and Enright, a sea of asphalt with the new Moonrise Hotel rising in the background. Hopefully in the future this part of the Loop will be so successful that demand will dictate the construction of new mixed use buildings lining Enright with a garage behind. Such a concept has been proposed at least a few times on the large lot in U City off Kingsland, but has yet to come to fruition. With the Metro station only a couple hundred yards east, maybe it could happen here first. 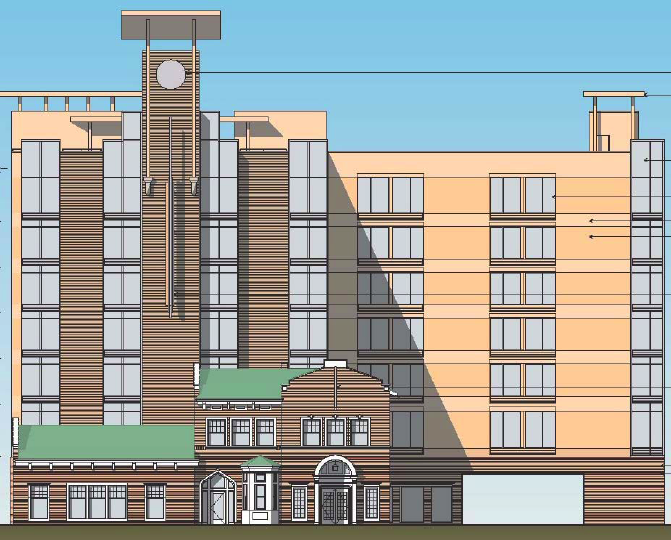 The Moonrise, a new 7 story 124 room boutique hotel is rising in The Loop on the site of a former funeral home at 6175 Delmar between the Pageant and the Pin-up Bowl. The funeral home was demolished to make way for the hotel, but the historic front of the building is being re-constructed as the lower facade of the hotel, with the tower rising behind. A restaurant will occupy the area that would have been the former front rooms of the funeral home, and a rooftop bar and outdoor terrace atop the hotel should provide spectacular views of the City. The Moonrise will be one of the only examples that I aware of in St. Louis where a historic facade is preserved or re-built as part of a new larger structure. 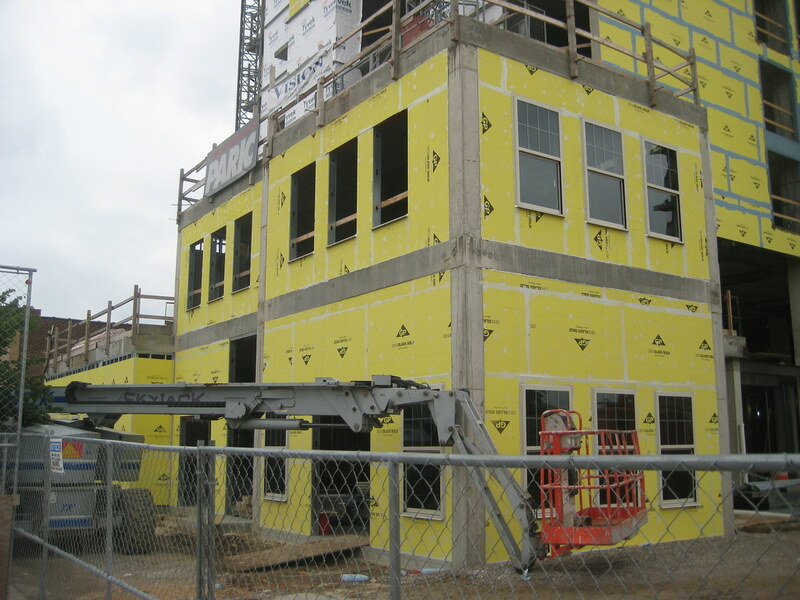 This practice, which is more common on other larger cities is known as facadism. 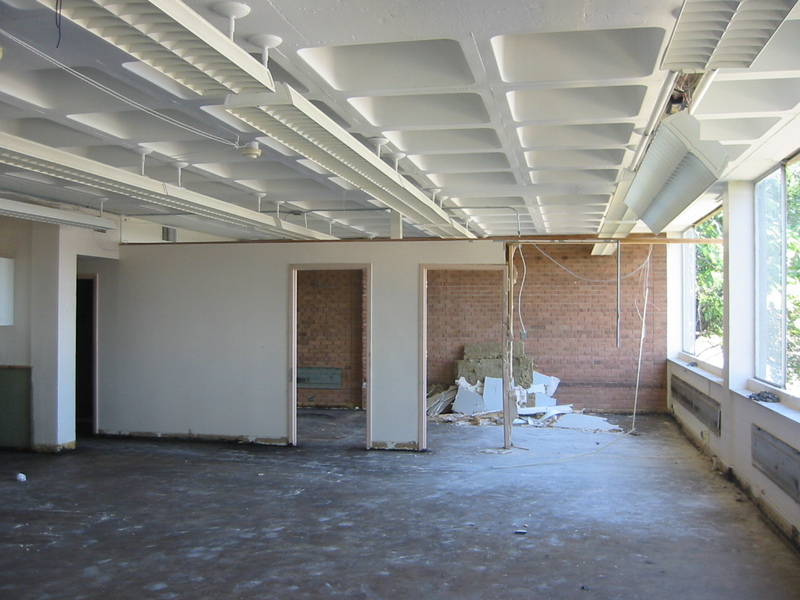 The practice is often controversial due to the fact that all the interior portions of the building are typically destroyed. In this case however, like many funeral homes, only a few front rooms could have been argued as having any historic significance, and here these were not really overly ornate. As the photo above partially shows, beyond the first 20 feet of the front of the funeral home was a plain flat roofed brick box with no ornamentation. 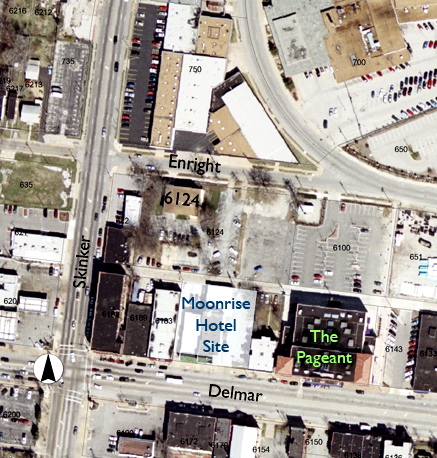 The Moonrise Hotel is the brain child of Joe Edwards, who is responsible for most of Delmar's rejuvenation east of Skinker and the extension of The Loop district east to the Delmar MetroLink station. 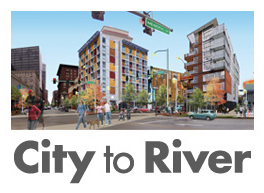 This project is example of what is unfortunately a fairly rare occurrence in St. Louis. While a historic building is demolished, the most significant portion is re-built and becomes part of a new landmark structure. The materials of the new tower are not luxurious. 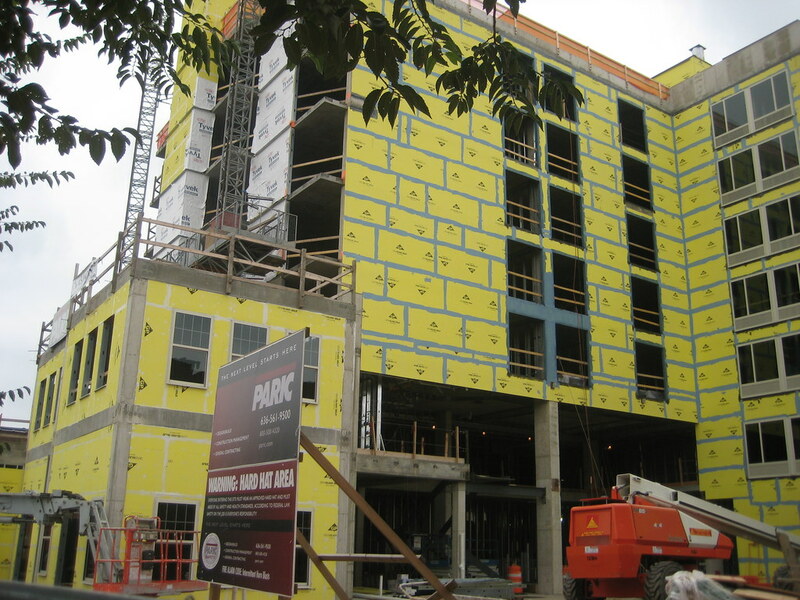 The exterior will be a mix of EIFS and brick, but unlike many newer hotels of this size, the building does not try to achieve false grandeur by adding over-scaled goofy cornice elements at the top of the building. 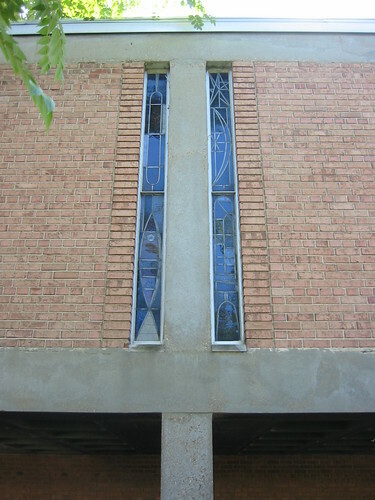 The building is unabashedly modern in contrast to the funeral home facade. The one element of whimsy will be the tower which instead of clock faces, will display the current phase of the moon. Notice in the photo above that the streetscape trees and lighting is protected out of harms way, and an accessible covered walkway is provided during construction... also rarities in St. Louis. 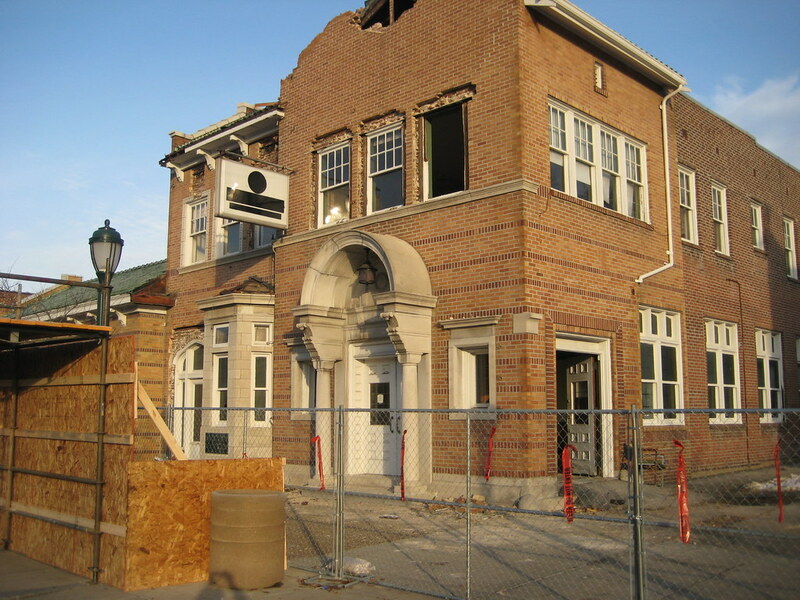 The main entrance and lobby will be located behind the rebuilt facade with a drive off Delmar in the same location as the original drive of the funeral home. A tunnel through the rear wing of the L shaped plan will lead to the large existing shared parking lot to the north. New windows going in the re-built portion of the funeral home. The completed Moonrise Hotel is scheduled to open in April 2009.